Burn fat while sitting down…. sounds too good to be true, right? Well, let me introduce you to TruSculpt, a body sculpting treatment that eliminates fat cells—I’ve tried it and it works. A bit about me: I exercise regularly and eat a balanced diet. Every week I do a combination of weight training, running, and swimming, and yet I can’t seem to move fat in particular places—especially around my upper arms. It’s frustrating, to say the least. So, I booked a treatment with Dr. Anna for TruSculpt, the latest in body contouring technology. And following just one session, I’m starting to see results. 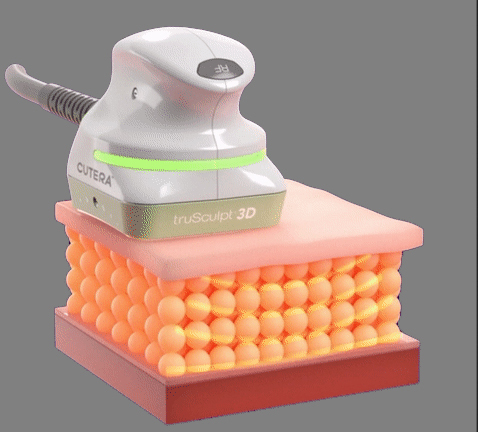 TruSculpt is a hand-held device that heats up and is applied directly to the troublesome area. TruSculpt can be used on most areas where fat tends to pool including thighs, back fat, tummies, saddlebags and in my case—bingo wings (also known as the tops of my arms). The device applies extreme heat to the fatty tissue, and while it’s not very comfortable, Dr. Anna moved the device to a new area when I signaled that the surface got too hot. The session took around 15 minutes. Afterward, my arms were a little hot and red—similar to a sunburn—but this dissipated within the hour. It’s a fact: fat does not like heat. By heating the fatty tissue, the fat cells are damaged and eliminated. TruSculpt penetrates deep to treat the entire layer of fat, from skin to muscle, and is clinically proven to eliminate fatty tissue regardless of a person’s shape or body type. On average, 24% of fat cells are irreversibly damaged during one treatment. One month after treatment, my arms are tighter and feel less heavy. The fat cells damaged by TruSculpt are excreted through the body over the course of three months, and healthy diet and regular exercise will help this fat-loss process. I truly recommend TruSculpt by Dr. Anna… the only problem is, deciding which area to tackle next! Want to find out more about TruSculpt? Book a complimentary consultation with Dr. Anna or contact her directly.